Garut is an Old Dutch hill station and a characteristic Sundanese town in the highlands, surrounded by mountains, volcanoes, and crystal clear lakes. Garut’s Hindu temples and hot springs are often the destination for hikers attracted by spectacular views from the mountaintops. The choices of where to plan the next trek in the area are as varied as the sights along the way. 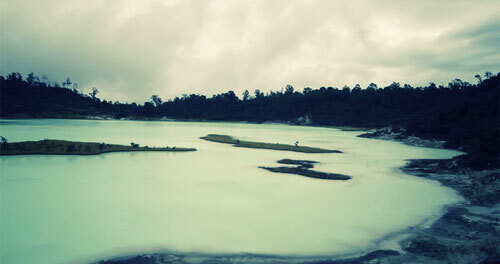 Some like to hike across to Mount Telaga Bodas with its pale-green Crater Lake bubbling with pure sulfur. This cool place can be reached from Bandung in approximately one hour. Due to the scenic beauty of this there are many places of interest for nature lovers. The northern part of the region is reserved for the development of the city of Garut while the southern region is rich with a beautiful coastline, nature preserves and beautiful scenery. Since the time of the Dutch occupation, this region has been developed as a resting place. The inhabitants of Garut are mostly Moslems and more than half of the people live on farming. The specific food from this place, which is very famous, is “dodol Garut”, a sweet food made from sticky rice flour and sugar with various flavorings. This food is offered in different wrappings and can be store for a long time. In the past, Garut was also famous for its high quality oranges. The hot springs resort at Cipanas has comfortable accommodations. Many people visit these laden springs, which have medicating effects to purify their skin. Mount Papandayan’s crater is probably one of the most spectacular mountain scenes on Java Island. There is the Cangkuang temple situated by Cangkuang Lake, which was a major discovery of archaeological value as it was the first of its kind found in West Java, dating back to the 8th century. The site is located 17 km from Garut and 50 km from Bandung. Garut has a specific cultural attraction, the “Ram Fight”. Two strong male Ram, with big, long and strong horns are made to fight against each other in the center of a arena, usually in a field, accompanied by “Kendang Pencak” music. There are three centers for ram high performances: in the districts of Bayongbong, leles and Samarang. The participants mostly come from the surrounding place. In Garut there are a lot of interesting places to visit, some have been developed, some others are being developed and there are places, which are still left natural.